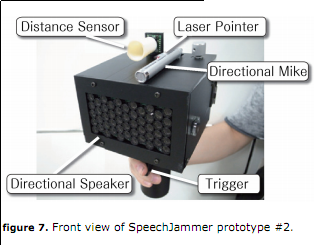 In this paper we report on a system, "SpeechJammer", which can be used to disturb people's speech. In general, human speech is jammed by giving back to the speakers their own utterances at a delay of a few hundred milliseconds. This effect can disturb people without any physical discomfort, and disappears immediately by stop speaking. Furthermore, this effect does not involve anyone but the speaker. We utilize this phenomenon and implemented two prototype versions by combining a direction-sensitive microphone and a direction-sensitive speaker, enabling the speech of a specific person to be disturbed. We discuss practical application scenarios of the system, such as facilitating and controlling discussions. Finally, we argue what system parameters should be examined in detail in future formal studies based on the lessons learned from our preliminary study. The idea is to use the well-known phenomenon of "delayed auditory feedback" to interfere with the speech production process of people that the wielder of SpeechJammer finds annoying. By plugging a telephone headset into the playback jack, a person's voice may be returned to his own ears but delayed by the length of time the tape requires to move from one magnet to the next. The effect of this delayed and dominating echo is startling — it will cause the person to stutter, slow down while raising his voice in pitch or volume, or stop completely. For background on delayed auditory feedback, see "This delayed and dominating echo", 2/14/2010. Update — I should add that shorter-delay auditory feedback has been claimed to reduce stuttering symptoms. For a review, see e.g. Elena Antipova et al., "Effects of altered auditory feedback (AAF) on stuttering frequency during monologue speech production", Journal of Fluency Disorders 33 (2008); or Michelle Lincoln et al., "An Experimental Investigation of the Effect of Altered Auditory Feedback on the Conversational Speech of Adults Who Stutter", Journal of Speech, Language and Hearing Research, 53(5) 2010. Thread hijack, I know, but howja like the syntax of "disappears immediately by stop speaking"? A device like this showed up in Captain Marvel comics back in the 1940s, to prevent Billy Batson from saying his magic word. COuld be prior art if they try to patent it. I'm struck by the term "playback jac" in Bernard Lee's 1950 article. Is/was that general usage? Is the place where you plug in a microphone the "mic jac"? Surely you could learn to keep speaking after you had gotten used to the effect, right? Doesn't seem like it would be all that reliable to me. A bit reminiscent of Burroghs' action aainst the scientologists, using recording and reproduction to disorientate and influence. I've encountered this myself with echo on a phone line. There have been a number of experiments on this subject. I seem to remember an exhibit in the Exploratorium too. The range of delays that make it impossible to speak is quite limited. If it's shorter or longer you can force yourself to ignore it. The late Bob Pease, noted analog engineer at National Semiconductor, reported silencing his annoying boss with a voice-controlled white noise generator. The louder the voice, the louder the white noise. I've had the same experience as maidhc — this feedback used to happen quite frequently to me when calling a certain friend's cell. It was incredibly rage-inducing (not to mention effective at preventing me from talking). I don't know, speechjammer, without the CamelCase, made me think of a ship of some sort propelled by windy politicians. Fingers stuck in ears. Problem solved. 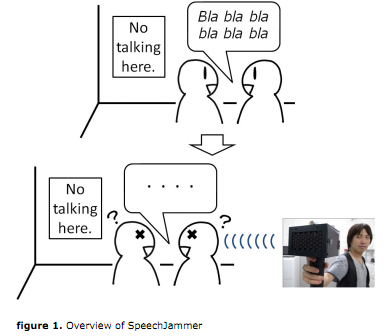 Sophie Scott at UCL's Speech Communication Lab has a nice short post on this. My first experience of the phenomenon, mild phone-related effects aside, was in Vienna's Haus der Musik, which has (or had) a headphone booth demonstrating the effect: users could adjust the timing to observe different degrees of interference.